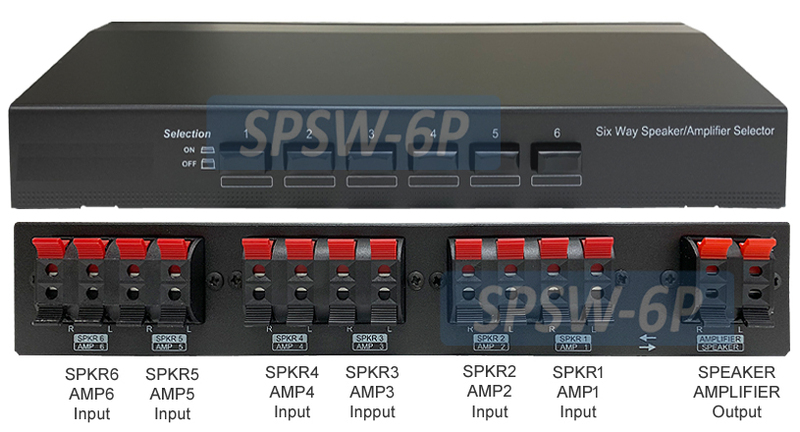 This speaker switcher allows users to connect multiple pairs of speakers to single stereo receiver or amplifier or the other way around for multiple amplifiers/receiver connected to single speaker pair. An advanced and compact stereo speaker/amplifier selector suitable for home or Hi-Fi shop to use for comparing the performance of different speakers or amplifiers. You'll be able to enjoy music anywhere in the house while protecting your amplifier from damage and maximizing the performance of your entire music system. This speaker selector allows connection with up to 6 speaker pairs to a stereo system for music throughout home, office or retail location. Great speaker switcher choice for the audiophile with several speakers to set up. No need to disconnect and reconnect the speaker wires all over again between speakers. Put up all of your speaker sets together for connectivity. Some speaker sets may be favored for going with particular audio players or receivers so the choice is easy to be made through one press of the buttons through this switcher. Big convenience for having all speaker wires hooked up to the same speaker switch so your choice of speaker is only a push button away. By connecting multiple speaker pairs to this speaker switch and then outputting to one stereo amplifier, users can easily select any single set of speakers to be active for performance. Users can switch from one speaker pair to another seamlessly and experience different sonic quality that each speaker pair delivers by toggling through the push buttons on the front panel of this switch. 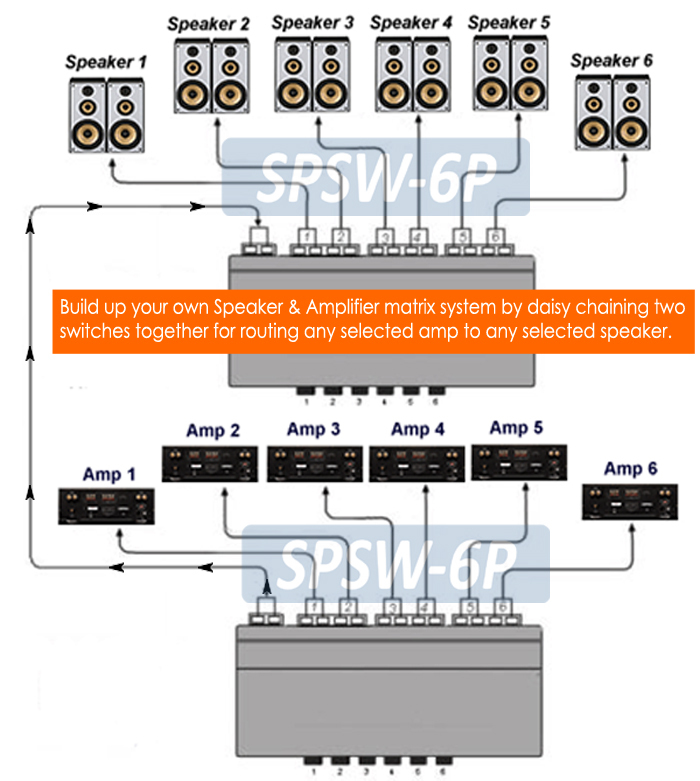 [Note]: This speaker switch model does not allow multiple speaker pairs to be selected at the same time. Only single pair of speaks can be selected for active performance at a time. 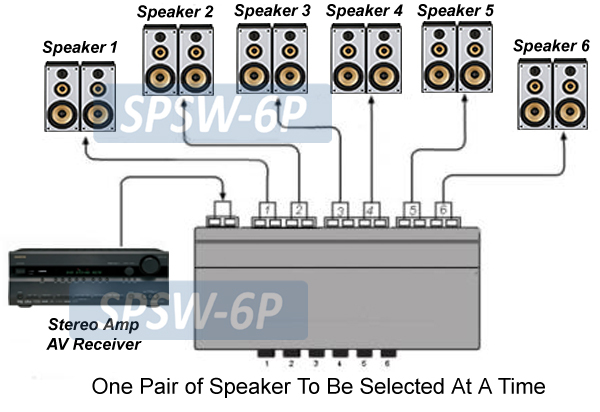 Please check out our SPSW-8P or the deluxe SPSW-5P model for setup if multiple speaker pairs needed to be selected at the same time. This speaker select can also be used in the opposite way, imagine having multiple amplifiers connected with one speaker pair for the setup. Since each stereo amplifier having its own sonic character, users may connect different power amplifiers to this switch and then outputting to the same speaker pair. Through this setup users can easily choose the most suitable amplifier that can provide maximum performance for cleaner sound, heavy rhythms or for favorite high gain sound. By toggling through the push buttons on the front panel of this switch, users can switch from one amp/receiver to another seamlessly and compares the performance of different stereo amplifier or receiver through the same speaker set. Connecting multiple speakers to one audio amplifier/receiver as speaker selector. One speaker pair can be selected a time. Connecting multiple amp/receivers to one speaker pair as amplifier selector. 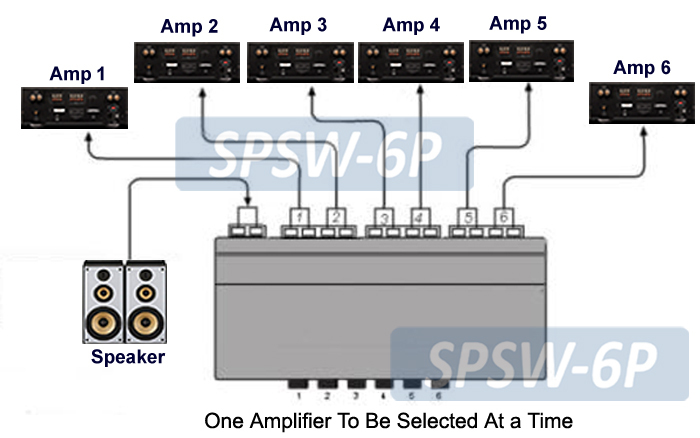 One amplifier/receiver can be selected at a time. High current amplifier protection circuitry allows for connection with up to 6 speaker pairs without damaging your amplifier. Protection circuitry safely guards unselected amps or speakers. Each selection through through the manual push buttons on the front panel. Daisy chaining multiple units together for routing any selected amplifier/receiver to any selected speaker pair for output. Independent left/right channel ground paths for compatibility with all stereo amps. Snap-in push terminals provide quick and safe connection. Supports amplifier capacity up to 100 watts and all type of speakers from 4 to 16 ohms. Featured with convenient snap push terminals that accept up to 12 AWG speaker wire. Robust, deluxe steel metal housing and well-shielded. Passive routing switch. No external power supply required. Independent left and right channel ground paths.